Ben moved into one of New Haven Farm Home’s Richmond based sites earlier this year. Ben has a real interest in martial arts movies, particularly those staring Jackie Chan or Bruce Lee. This interest influenced Ben’s ambition to learn and develop skills in Taekwondo. Ben trains in Taekwondo twice a week. He really enjoys the sport and is developing some great skills. Ben is always very determined and focussed during lessons and training as he works towards his next belt grading. Learning about history and movie trivia is another interest of Ben’s. 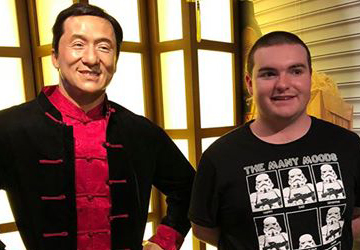 He recently took a trip into the city with his New Haven Farm Home support worker to see the Madame Tussauds Exhibition in Sydney. Ben really liked learning new trivia and facts about his favourite famous icons and their history and was very impressed by the lifelike detail replicated in the wax displays. While in the city, Ben also visited the Sydney Aquarium and enjoyed learning about the different species of fish and sharks that he saw. Ben is also very interested in video games and anime and enjoys chatting to people who share his interests.